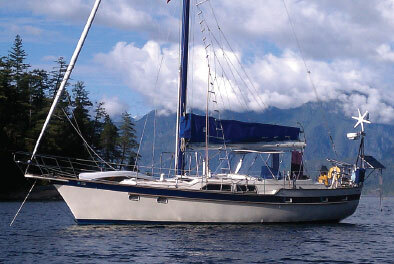 Purchased originally for a family long-distance cruise, this boat has morphed into the perfect retirement cruiser. 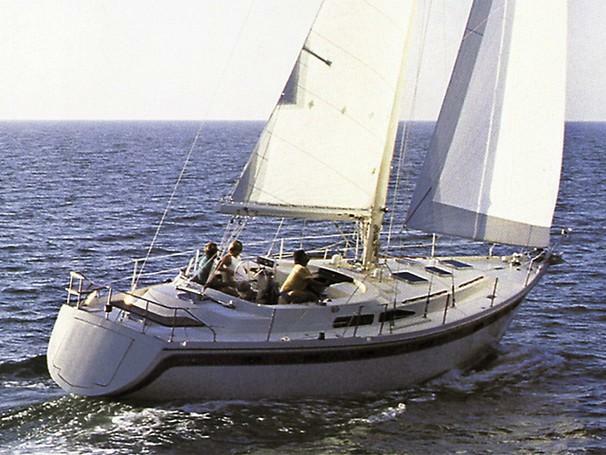 Wayne and Elizabeth Gilham bought a used 43-foot centercockpit sailboat in 1998 as a long-distance cruiser to take their family on a dream voyage to the Bahamas and beyond. 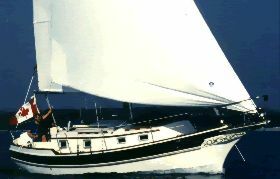 Since then, the sailboat has morphed from a boat for four to what the couple considers the perfect retirement boat for two. The Gilhams bought the used 43-foot center cockpit Irwin in 1998. The couple kept looking but kept coming back to the Irwin. “It was in good shape. It hadn’t been sailed very hard over the years, and the engine had only 500 hours on it after 13 years,” he says. The Gilhams bought the boat for around $90,000. The parents used the big aft cabin, with its en-suite head, and the teenagers bunked in the forward cabin and quarter berth bunks, sharing the forward head. With the cruise completed, the Gilhams decided to put the Irwin up for sale, but it didn’t move. “There were several other Irwins out there at that time, and it was a down market in general,” says Gilham. So they kept it. “We realized at one point that we had already bought our retirement vessel,” he says. 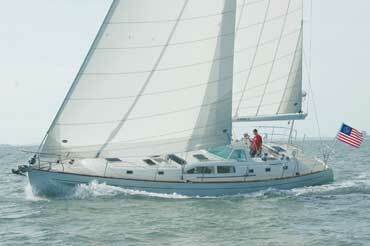 Designed for bluewater cruising, the Irwin 43 Mk II shows a sturdy profile. The tall bow is flared to shed seas, and freeboard is ample. Below the waterline, the deep forefoot is joined to a shallow fin keel, which houses the centerboard. 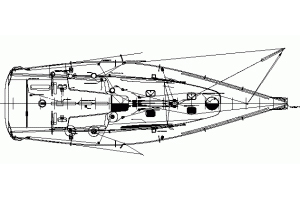 (A deeper keel without the centerboard was available.) 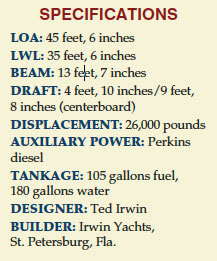 Ballast is 7,000 to 8,000 pounds. The spade rudder is skeg-mounted. 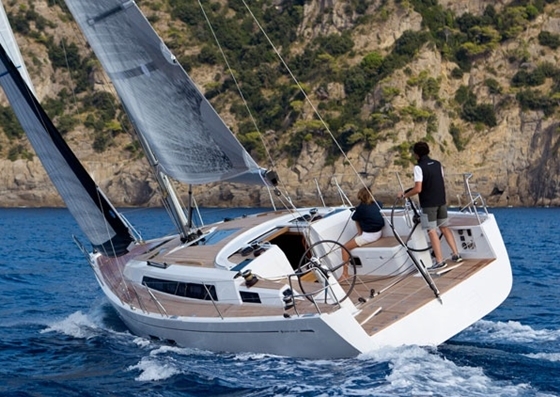 On deck, the Irwin 43 Mk II carries a high-aspect cutter rig with twin headstays, giving the boat a variety of sail combinations. There’s also a sloop-rigged version. 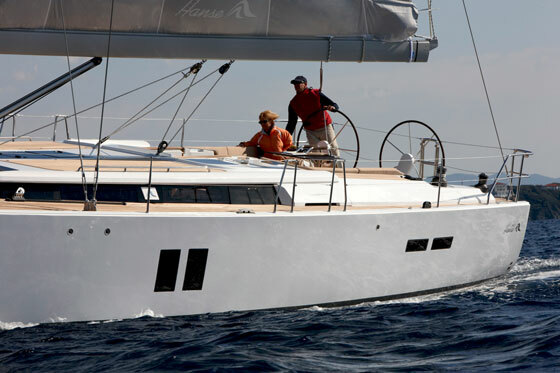 The large, open foredeck and wide side decks leave plenty of room for sail handling and anchor work. The center cockpit is mounted well abaft the trunk cabin and sits relatively low. Below, starting at the stern, the aft master cabin is equipped with an adjacent head with a separate shower compartment. Over/under berths are placed to port alongside the cockpit companionway. The saloon has seating to starboard and an L-shaped settee/ dining area to port. The galley down is to starboard beside the companionway. There’s a forward cabin closed off behind the saloon bulkhead, with a V-berth and its own adjacent head and shower. Steve Knauth is a contributing writer for Soundings Magazine. This article originally appeared in the January 2011 issue.